Black. I love black cars. I seems like they get through the day, only to come alive at night. They just look different at night, putting all other cars to shame. I know some collectors don’t like black models, because all the dark hides the casting’s details. Maybe, but that is why most models come in many colors. Feel the black model, and enjoy the details on the silver model. Here is a black beauty that looks exactly like it should. I know Lamborghini only produced the Reventon in gunmetal grey, and then let HW have fun with the casting with oranges, greens, and other designs. 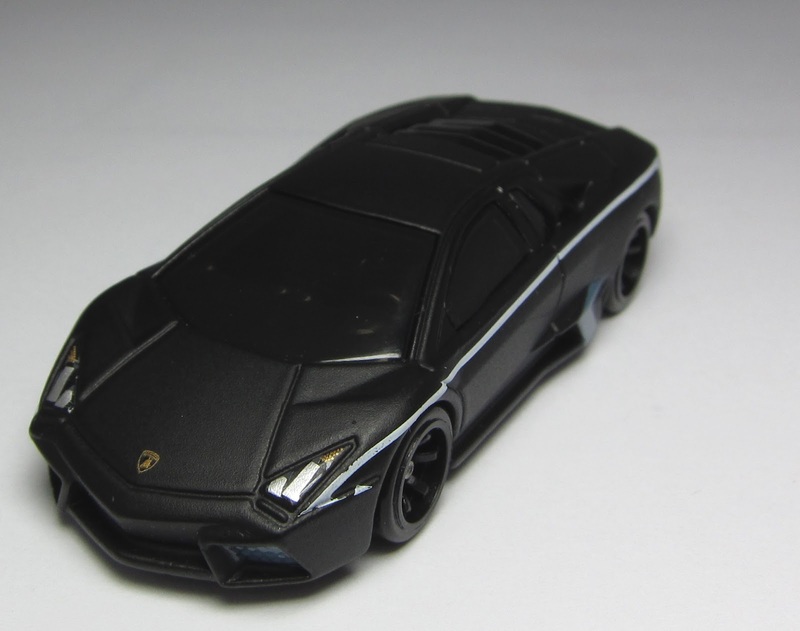 But if the Reventon was not going to don the grey, then it should be the black. The Speed Machines line was one of my favorites, and many shared in my disappointment when the line was discontinued. I think as time passes these models will become more and more sought-after, and this one will be right up there at the top of the list. I'm one of those who shies away from a black-painted model if he can help it. Because I collect only one of a given casting, multiples are not possible. Well, they are, but my stuff is already on the edge of out of control as it is. Multiple examples of a casting will put me over the edge. A well-lit studio like the one John uses can help show off the shape just fine; but in my black architectural flat-file drawers, with the black matting to keep cars from rolling, and in natural/incandescent lighting, black cars simply disappear. Hi im known as dirtysock47 on hwc. I have this model and as far as ino this model is extremely rare. I found a guy asking $70 and he sold.